"Harry, don't let my husband stand in the way of our love." 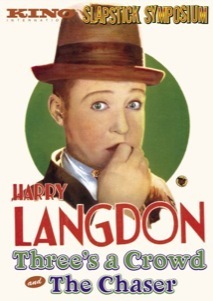 Harry Langdon was one of the popular silent comedians in the mid 1920s, with a hapless character with a mystified baby face, ever the victim. Despite his popularity, his renown cratered, never to recover, with the release of several films in the late 1920s, two of which are collected on this disc. While they will be welcome for Langdon completists and those curious about what happened to his career, they're rather tough going for anyone else. Three's a Crowd (1927) features Langdon as a lonesome manual laborer who longs for a family. He stumbles into one as Gladys (Gladys McConnell), escaping from her abusive drunkard of a husband (Cornelius Keefe) while on the verge of giving birth, literally collapses in a snowbank in front of Harry. Eager to be useful, he takes her in and enjoys the prospect of having a family of his own. Unfortunately for him, fantasy is more enjoyable than reality as her husband comes to reclaim her and the child. There's a lot here in common with Chaplin's The Kid (1921), which featured another surrogate father. The problem, which is no doubt part of what caused Langdon to lose his audience, is that he picked up Chaplin's focus on pathos and poignance but seems to have utterly forgotten to include any comedy of any kind. There is a charming sequence as he dances with a doll in imitation of his boss bouncing his young son, but it's hardly funny, and the picture just turns more and more grim as it goes on. There's not a single laugh to be had in the entire picture, which has a thankfully brief running time. Nearly as short is the followup movie, The Chaser (1928), which takes Langdon to actual married life (with McConnell again). Henpecked and threatened by his mother-in-law (Helen Jayward), he finds himself sentenced to 30 days taking his wife's place in the kitchen, in order to deprive him of his manhood (a concept so utterly offensive in so many ways to modern eyes that it boggles the imagination). After several mishaps involving the lame expedient of cross-dressing and a seeming ability to lay eggs, the movie suddenly shifts gears altogether and becomes an entirely different picture in the second half as Harry goes golfing with a buddy and then helps him ogle a group of bathing beauties. It feels rather like two three-reel shorts crammed into one feature film, and the differences in tone are completely jarring. On the other hand, there are at least some lame attempts at comedy here, though I'm still unable to fathom what the title is supposed to refer to. Langdon's molasses pace is even more extended here, as he keeps the camera rolling on an empty room long after the characters have departed, for no apparent reason. Methodical is one thing, but this is a tedious extreme. There's a fair amount of homophobia on display here too, amidst the moments of whimsy. The last segment gets quite surreal as Langdon dresses in his lodge uniform like a ridiculous little Napoleon. It's not enough to save the disc, but it's at least watchable. Image Transfer Review: The original full-frame picture is hit and miss. Derived from Raymond Rohauer prints, Three's a Crowd in particular looks great during much of its running time, but for several lengthy stretches nitrate decomposition almost wholly eradicates the onscreen image. Somehow, that's thematically appropriate. The intact segments have terrific greyscale, texture and detail, and obviously are from very early generation source materials. It's too bad they were allowed to fall to such ruin. A solid A grade for the intact segments, but a D at best for the rest. Audio Transfer Review: Lee Erwin contributes organ scores for both films. While suitable enough, they're not particularly noteworthy and the audio quality seems a bit on the thin side, without the deep boom that one would hope for from a proper theatre organ. The commentary is recorded at very low levels. While Frank Capra leaving Langdon's employ often gets the blame for the comedian's downfall, it's clear from the evidence of these films that it was an uncontrolled tendency to take himself far too seriously that lost him his audience. Think Interiors without the wit or the competence. The source prints are alternately gorgeous and utterly decomposed.